Copy-paste is the most basic function in a computer. If it stops working, working on the computer would become difficult. Here’s how the copy paste-function works. Whenever we copy a text or an image, it is saved on a virtual clipboard that we cannot see. When we paste it, it is pasted from the clipboard. All this is managed through a few services and if the copy-paste function does not work, we could focus on those services to fix the issue. 1. Go to file explorer. 3. Now, search rdpclip in the search bar. 4. 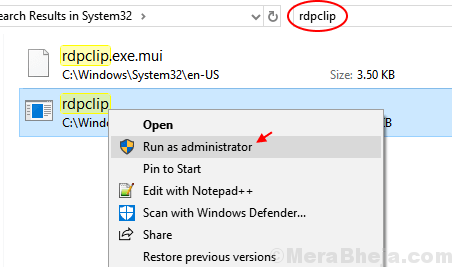 Right Click on rdpclip.exe and Choose Run as Administrator. 5. Similarly, search dwm.exe in the search bar. 6. Now, Right Click on dwm and Choose Run as Administrator. 7. Restart Your Computer . If it does not solve your Probolem, Move on to the next method. The copy-paste function is managed by the rdpclip.exe process. This process might get stale with time, thus we would have to reset it. 1] Press CTRL+ALT+DEL and select Task Manager from among the options. 2] In the processes tab, check for the rdpclip.exe service. 3] Right-click and click on End process. 4] Now close Task manager and open it again. 5] Go to File >> Run new task. 6] Type rdpclip.exe in the dialogue box and press Enter. It will re-initiate the process. 1] Press Win + R to open the Run window. Type the command cmd and hit Enter to open the Command Prompt window. This command ends the rdpclip.exe task. 3] Type rdpclip.exe in the window and press Enter. This command re-initiates the rdpclip.exe task. We could do the same for the dwm.exe task from the Task Manager. 1] Open the Command Prompt window as suggested in the previous solution. At times the issue with the copy-paste function might not be system specific but application specific. We could check if the function is not working with specific applications. Eg. If you were unable to paste the image in Paint, try copy-pasting text on Notepad. If the issue is specific to a certain number of applications (or maybe just one), troubleshoot the application accordingly. At times, the anti-virus program prevents the copy-paste function for security reasons. Disabling the anti-virus program temporarily could help isolate the issue. We could also try Windows own in-built troubleshooter. 1] Click on the Start button and then on the gear-like symbol to open the Settings menu. 2] Go to Updates and Security >> Troubleshoot. 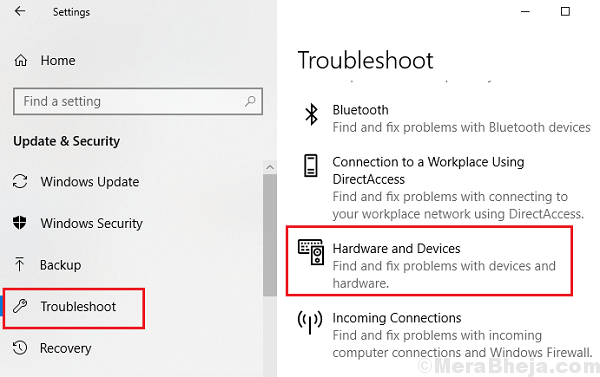 3] Select the Hardware and Devices troubleshooter. 4] Once the process is done, restart the system. Hope these resolutions help fix your problem.